Last Saturday, a few friends and I decided to go for a wine tasting after breakfast at the Meadowood Grill. 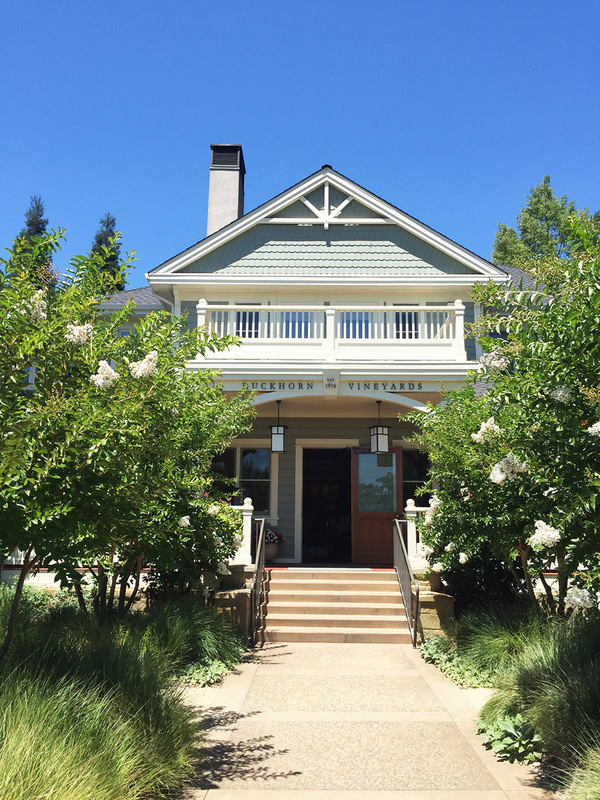 I hadn’t been to Duckhorn Vineyards in quite a while and figured it was early enough to get a reservation. I used Open Table through the link from Duckhorn’s website because I know for a fact that Duckhorn rarely answers the phone on weekends. If you are coming from out of town, it is best to plan ahead and call during the week. This rule stands for most wineries that accommodate sit down tastings. As a local, and a member of Goldeneye (Duckhorn’s sister winery), this was not my first time to the property. When friends ask me where to go, I usually mention it as one of my go-to tasting experiences. Duckhorn is probably one of the more picturesque wineries in Saint Helena, which is just off Lodi Lane and the Silverado Trail. We drove through the quaint vineyard, coming upon an idyllic craftsman house with a large covered deck and beautiful grounds. Upon arrival and check-in we were presented with a glass of the Duckhorn Sauvignon Blanc and taken out onto the veranda for a sit down tasting. I highly recommend requesting a table outside on the deck as it is a beautiful, relaxing setting. When we arrived at the table it seemed a bit astounding. There were many glasses set up in rows, one for each wine. This was a fairly extensive tasting, two merlots and two cabernet sauvignons in addition to the sauvignon blanc and bonus pours. Bonus pours are just that, an extra pour of something you weren’t expecting. Being a wine club member, we tried a total of nine wines. A sauvignon blanc, chardonnay, pinot noir, two merlots, three cabernets and the Discussion. Starting the Duckhorn tasting on the patio. 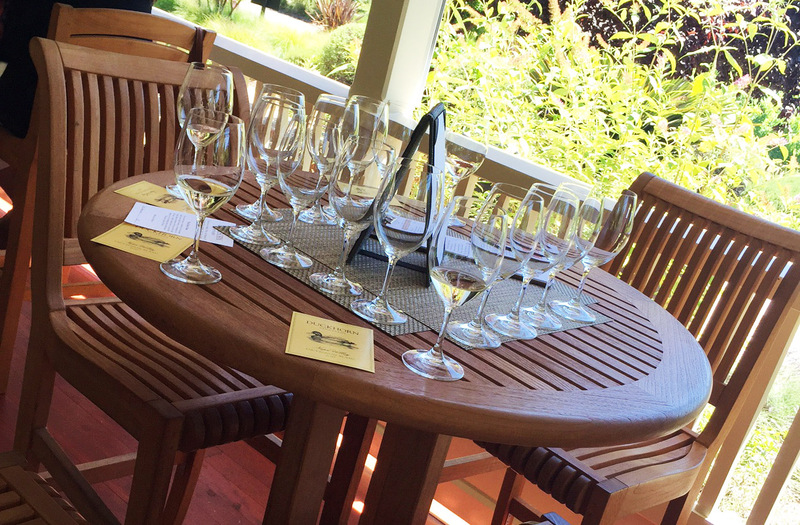 The 2015 Duckhorn Vineyards Napa Valley Sauvignon Blanc had been released 3 weeks prior. It had nice tropical notes on the nose and citrus undertones. I didn’t find this wine as crisp as some of my favorite sauvignon blancs. I felt it was young and had more of a french-style finish. This wine is fermented in 100% french oak therefore wouldn’t be as crisp as a stainless steel fermented sauvignon blanc. It showcased pleasant citrus on the palate with hints of lemon, lime and grapefruit. 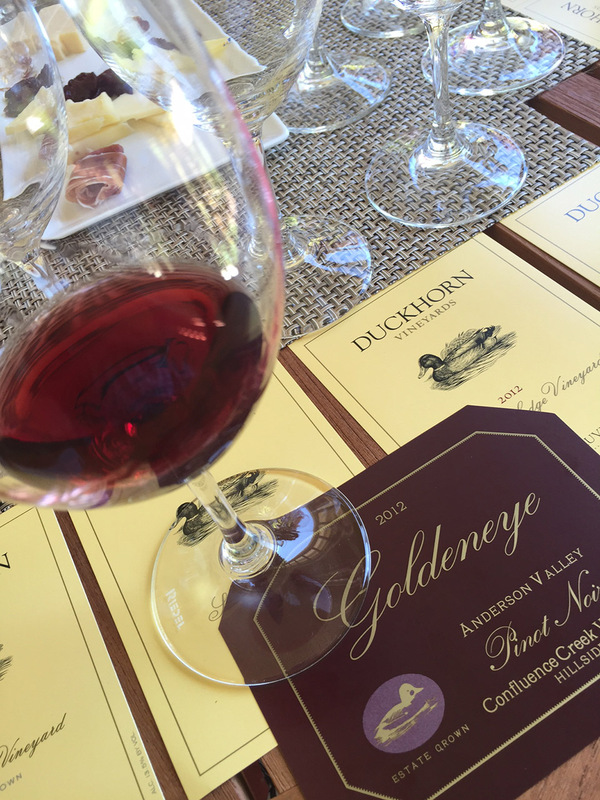 The 2012 Goldeneye Anderson Valley Pinot Noir Confluence Creek Vineyard Hillside is a single vineyard Dijon clone north of Napa Valley. It had a nice dusty, earthy quality on the nose with a jammy taste and a toasted note on the finish. The color was a beautiful ruby red. You could definitely drink now or cellar it for a few years. It was released September of 2015 so it has had some time to age already. Most of the merlots and cabernets that Duckhorn pours should be cellared. These wines are fairly young so it’s important to imagine how the wine may taste after many years. The 2012 Duckhorn Vineyards Napa Valley Merlot Rector Creek Vineyard is not an exception, however, I did find it to be smoother than the Stout Vineyard merlot. I experienced notes of dark fruits like blueberry and cherry on the nose and cherry, plum and chocolate on the palate. It had a nice oak aspect and ended smoothly. The 2012 Duckhorn Vineyards Napa Valley Merlot Stout Vineyard was very different from the Rector Creek in that it was much more earthy and tannic. This one you would definitely want to cellar. I observed leather on the nose and savory on the palate with hints of cranberry. This was a bold wine and the bountiful tannins give it a long finish. I paired it with a little prosciutto from the charcuterie plate which gave it a nice balance. The 2012 Duckhorn Vineyards Napa Valley Cabernet Sauvignon Monitor Ledge Vineyard was the most approachable of the bunch. I got hints of anise on the nose as well as floral notes. It was smooth on the palate with just the right amount of tannins and red fruit. The 2012 Duckhorn Vineyards Napa Valley Cabernet Sauvignon Patzimaro Vineyard is intense in color and in flavor. Notes of cola and stone and cherry on the nose and olive notes on the palate end with a long finish. This one should also be cellared a good 10-15 years. Last on the list was the 2012 Duckhorn Vineyards Napa Valley Cabernet Sauvignon Three Palms Vineyard. This vineyard is located up valley where it is warmer and therefore ideal to grow cabernet. It had a nice oak on the nose but this wine felt really tight. The tannins on this wine were strong all the way through and I really felt it mid palate. The Three Palms cabernet is definitely age-worthy and Wine Enthusiast gave this cabernet 91 points. I think we were all feeling pretty good when we left the winery. Luckily, we got to snack on a nice charcuterie plate and breadsticks while tasting. I ended up leaving with 6 bottles of 2013 Migration Russian River Chardonnay (another sister winery of Duckhorn.) If you have time, I recommend this relaxing tasting. It is a delightful change from the crowded tasting rooms on a Saturday. I agree with your assessment of the Sauv Blanc, and I think they do a nice job with the Pinots, but I was stunned as to the quality of the 2013 Duck Horn Chardonnay. Their restrained use of oak will appeal to many. It’s a party Chard!